Dr. Martin Luther King Jr.’s summary of Christian nonviolence stands as the counter balance to the undeniable truth of Neihbur’s understanding of human nature as expressed in the notion of Christian Realism. There is something in us that is stuck, broken, that bends on an arc towards self-preservation, egocentrism, and sacrifice of the other even when we seek to do good. 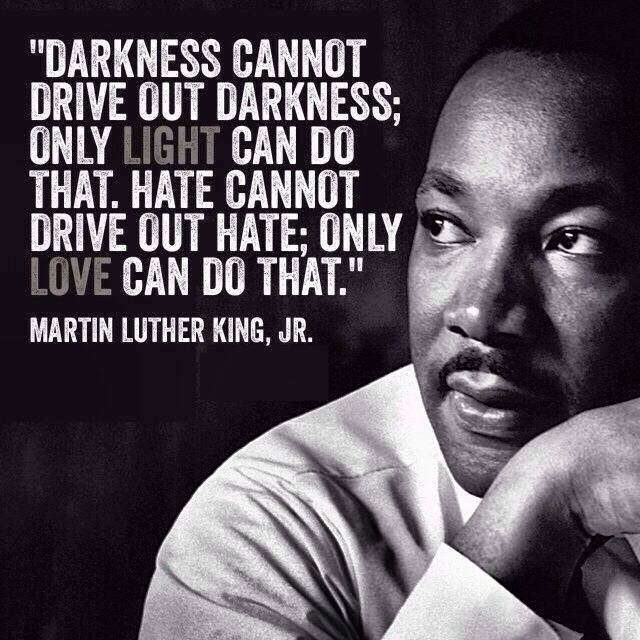 King’s concise statement about love and hate is a reminder of the teachings of Jesus of Nazareth: what is broken in us and in our world cannot be fixed by us and our efforts. It has to be undone by the opposite, transformed, redeemed, resurrected to a new way of being. These thoughts have been in a creative tension in my mind this past week. In light of the nonsensical deaths in Charleston at the AME church, I’ve come to see some of the ongoing events and processes around me in a different light. For the past years I’ve heard repeatedly that President Obama has stirred the racist pot, resurrecting racism so that it can rear its ugly head in our unified and peaceful society. I may be a bleeding-heart liberal living in a majority brown/black city, but I find such statements fabulously erroneous (in my most polite language). I live in a town that is majority non-white in terms of population, the public schools, the working population and the neighborhood in which I live. Equality is not our lingua franca, but rather its the dream to which we aspire, the goal towards which we press on with faith, hope, grace and humility. In my own leadership and involvement in the church – local and regional – I see a common characteristic. We encourage Racial-Ethnic communities, eager to provide spiritual care and nurture to all peoples, yet we deny by our structure those very communities a sense of stability and security that we in our “white” churches demand. Racial Ethnic churches seem to be populations more committed [or could it be culturally predisposed?] to financial commitment, social action – both in and outside of the church, regular participation and in terms of Christian identity than do predominantly Anglo congregations. [Racial Ethnic Survey Summary Statement] And yet, from what I’ve been able to gather in limited research and my own personal experience, it looks as if – in the PCUSA – and in the region I call home – these dynamic communities of faith and more often than not dependent upon Anglo-communities for property, shared space and the place in which to gather as the church. These are often relationships that are called “open” “honest” and “cooperative”, but in which only one party pays rent and incurs the majority of financial responsibility. In a sense we institutionally maintain Racial-Ethnic communities, begun for the large part in dying Anglo-churches within transforming urban cores, as share-cropping churches, from which we hope for results while also demanding money and allegiance. Many of these churches operate in areas and spaces long ago vacated and abandoned by our predominantly Anglo-communities. And yet our ecclesiastical institution and constitutions at the highest levels work in a way that regulates such Racial-Ethnic communities to relationships of dependence, helplessness and extreme vulnerability. Emanuel AME Church in Charleston was a target possibly because of its independence, full-voice and proud history. My words might sound callous, which is far from my humble intent. Emanuel AME was a church targeted because of its authority, full-inclusion and invocation of what we have long called the Beloved Community. It is a church that has long sought to live out and into the vision of what God wants for the earth – best described as a feast table set with the finest meats and choices wines (of course vegetarians and non-drinkers would be welcome) for all peoples of all nations, a place where weapons are turned into weapons of agriculture, where there are no more tears, only true community. [Isaiah 2, Isaiah 25 & Micah 4]. I do believe that we sincerely desire for such a vision to become reality in our PCUSA Racial-Ethnic Church communities. But is our involvement and commitment only about results, in terms of membership numbers, growth and penetration into sub-populations foreign to our normal adherence? What price are we really willing to pay to have a community of the 100%? We need to start applying such committed idealism, and pragmatic hope to not just our polarized and partisan society; but to our unintentional relationship of serfdom in mainline protestant American Christianity between (for lack of a better vocabulary) Anglo and Racial-Ethnic Congregations.